In a reorted industry first, Celanese Corporation and International Paper have worked together in the application of a composite combining cellulose fiber from trees with long-glass fiber in a polypropylene (PP) matrix resulted in significant cost savings achieved by reducing weight up to 25 percent per part. The composite was used in the center console carrier of Ford’s 2018 Lincoln Continental luxury sedan. Implementing this solution achieved cycle time reductions of approximately 20–40 percent and significant energy savings resulting in an estimated 14 million kilograms of carbon dioxide reductions. Accounting for the largest single automotive part to date injected molded with sustainable plant-based composite materials, the center console carrier in the 2018 Lincoln Continental demonstrates that this natural and thermoplastic fiber blend can meet dimensional stability and component performance requirements while using existing tooling. 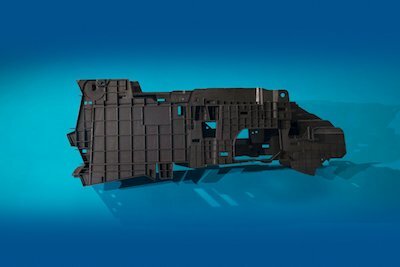 The Society of Plastics Engineers (SPE) in Automotive recognized this joint development in sustainable thermoplastics by Celanese and International Paper with the Environmental Award for Sustainable Materials in Automotive.